In February 2016, we helped our first group of students prepare for high school. It was a hectic year for us as we were still in the process of learning about the Costa Rican Educational System. One of our requirements was that students share their grades with us so we could provide early identification and remediation of any problems with their education. Our current group of seven students who graduated from the elementary school are pictured with their teacher. Each of these students will receive support from our organization based on a preliminary needs assessment, ability and desire to succeed in high school and the support of the students' parents. 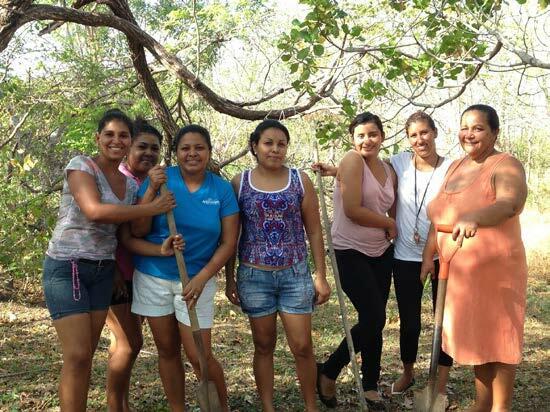 Students are from two communities: Altos Los Robles and Cascada which is located about one kilometer down the hill from Altos Los Robles. Overall, high school students have a higher rate of attrition than elementary students and, therefore, we focus our support predominately on the high school students. Although multiple factors affect attrition,one of the major reasons for NOT pursuing high school is the cost involved and the drain on family resources. Graduation day in December is considered a big accomplishment with much fanfare. Parents, grandparents, aunts and uncles are all present for the event! Prior to 1988, the closest school was in Playa Panama which is about a half an hour by car from the community. As most families do not own cars, the ability to pursue any education at all was severly limited. Marimba is a traditional and iconic symbol of Costa Rican folk music. Elementary students at Altos Los Robles have participated in local and national festivals and competitions. In 2014, we assisted the school with the cost of transportation to San Jose, Costa Rica so the students were able to compete. One of our new students, Ricardo Alvardo Mendez, is starting seventh grade in Guardia, Guanacaste. He is pictured here holding his new backpack with shoes, socks, pants and supplies. Visiting with Jeferson Coronado Lara in Cascada. He will be attending the Guardia high school in the tenth grade this year. We leave a questionnaire with each student to assess the items needed, parent's contact information and their signatures. Fabian and Fabricio Mendez were our helpful assistants this year. They assisted in the distribution and collection of our student questionnaires for high school. Not only do they know the students in the community and where they live, their Spanish is far superior than ours! An important component of our initiative is to involve and empower the students and parents in the community with our efforts. Team effort pays off big time in small rural communities! 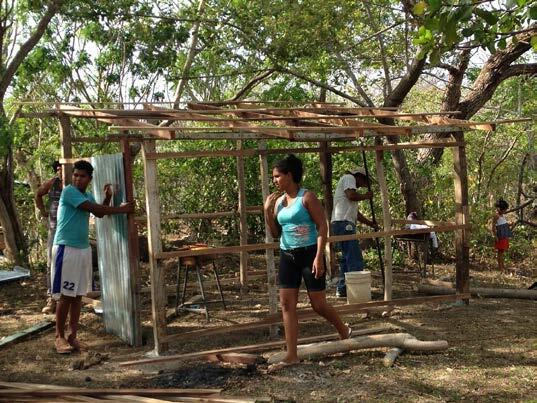 Most homes in this community are very small and can be constructed of cement, corrugated metal and wood. Water on a daily basis is a problem as the area has been plagued by a long, five year drought. Cooking is done with wood fires, and, water is available sometimes from large holding tanks located in the community. This year, the residents have told us that water is available for one to three hours a day. 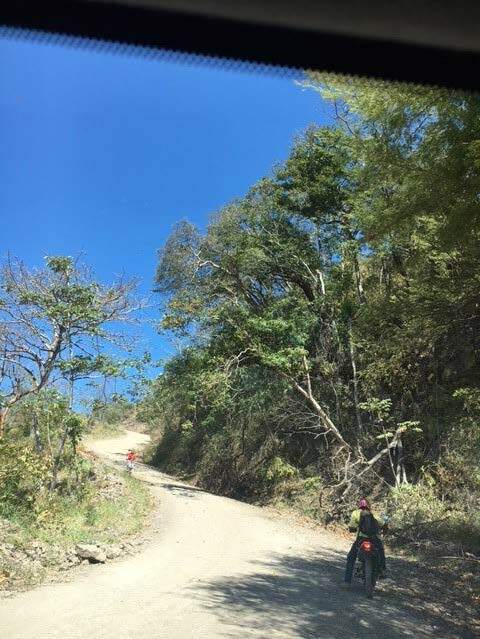 Photo shows residents collecting water from a nearby pool of water which is a kilometer away from the town, down a very steep and narrow dirt path. Later, water trucks would bring water up to the community which would be stored in large tanks. This year, water out of the tap is now available up to three hours per day for cooking, cleaning and washing. Another typical Tico house in Altos los Robles made of wood. Note the towers on the back of the property. Since Altos los Robles is high on a hill many internet and phone companies pay residents to build a tower on their property. The companies pay a family, we are told, about $50 per month to house a tower on their property. Dancers in the typical Costa Rican dress performed some of the traditional folk dances for visitors to the school. This was an event to raise money for the elementary school. Participants were community and surrounding area residents as well as tourists. 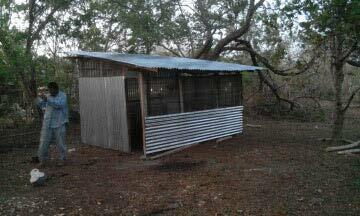 Our organization donated the money to build a community chicken coop and provide 10 chickens on the proviso that the community build the chicken coop, they take turns caring for and provide water and food for the chickens and split the eggs among themselves to serve to their children. Unfortunately, after about a year the project fell through for a variety of reasons. But it was the first time that the whole community pulled together on a project. 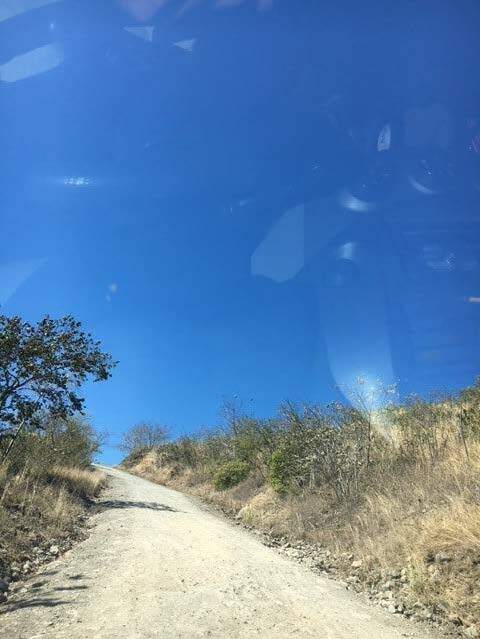 The above photos show the steep and dusty dirt road to Altos Los Robles which is three kilometers from the main road and bus line. OUR MISSION is to provide disadvantaged students with needed resources to overcome obstacles in their desire to achieve an education. As such our primary goal is to raise funds to support motivated and qualified students to further their education. Working with local educational institutions, parents and local nonprofit charities, we support and follow each student’s progress throughout the school year. OUR VISION is to break the cycle of poverty through educational achievement and promoting the development of economically viable and self-sufficient communities. We respect and nurture students to reach their potential and become contributing members of their communities. We want to strengthen cultural and educational values within the communities.